Houston rustic exterior doors are a great way to give your entryway a new look. Vintage decor tends to be timeless, making it a perfect choice for exterior design. Doors and other accessories can be expensive to buy and install. As a result, replacing them often is not always realistic. Opting for a look that will never go out of style ensures your home will not look dated. Old-fashioned charm can also make your home look more warm and inviting. Shopping for entry doors is a lot like looking for rustic interior doors. You should always focus on your tastes and preferences about style. If you hate the door you install, it will impact your feelings on your home. It is also important to find a door that is durable and one that works with existing decor. Depending on the style you choose, there may be other considerations to keep in mind. Regardless of the style you choose, visit Southern Front first. 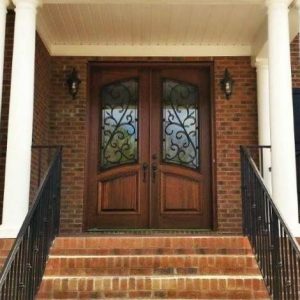 You can find a wide selection of doors available at Southern Front Stained Glass and Doors. They have almost every style available, including rustic fiberglass entry doors. Interested consumers can view their catalogue online by visiting http://www.southernfront.com. You can also contact Southern Front by calling 281-890-5860. When browsing, keep the following buying tips in mind. Southern Front will ensure you go home with the door of your dreams. Some homeowners prefer to avoid solid wood doors. Entry doors like these can feel stifling and can darken your entryway. While many rustic doors are solid wood, there are other choices available. Many people opt to install rustic exterior doors with glass inserts. These panels or inserts let natural light in while maintaining the vintage appeal. They are usually easy to clean and very low maintenance. There are a few things you should look for when shopping for these types of doors. As a rule you should always ask about the type of wood. Not all retailers supply high quality products. Be sure you know exactly what you are getting. You should also take a few moments to think about the style of wood and glass you want. Some people prefer frosted glass, to allow light in but maintain privacy. Others like the look of decorative glass. Think about your preferences and what style would look best in your home. Having a general idea of what you want before you shop can make the experience much more pleasant. If you are in the market for a door of this type, contact Southern Front today. Southern Front Stained Glass and Doors has a wide selection of rustic doors available. You can take a look at their products online at http://www.southernfront.com. Prospective customers can also contact them by calling 281-890-5860. They are happy to answer questions and help you find the perfect door for your home. Rustic fiberglass entry doors are rising in popularity. They do not warp, rot or change size the way wood does. They are also easy to customize, making them ideal for homeowners looking for unique styles. Fiberglass tends to be more expensive than wood. It also lacks the same warm feel that wood brings. However, many people prefer it for its longevity and easy customization. When shopping for fiberglass, be sure to focus on style. These doors can last a long time before they need replacement. Maximize your investment by finding a style that is as timeless as it is appealing. If you have concerns about the security of the door, speak with a sales representative. Some fiberglass feels thin but is deceptively strong. You can also inquire about composite solutions, involving both fiberglass and wood. Southern Front has beautiful rustic fiberglass doors available. They can ship to consumers across the U.S. and Canada. Browse their current selection by visiting them in store or online at http://www.southernfront.com. Prospective customers can also contact them by calling 281-890-5860. If you do not find a style you like, ask about custom options. Southern Front wants to be sure you love your home, and a beautiful door is the perfect start. Adding a front door with a speakeasy window to your home will add instant rustic charm. These doors are the perfect call back to the prohibition era. They bring to mind images of old-fashioned bars and nightclubs. Speakeasy doors are still used today, though less often and not usually for added security. Most modern uses are for looks and charm alone. There are a few modern styles available. Some have iron cages surrounding the window. Others have a sliding panel alone. Most doors made in recent years will also have a pane of glass separating outside from inside. Always buy a speakeasy door from a reputable vendor. Resist the urge to install a speakeasy window on an existing rustic door. These DIY attempts do not work out well for the homeowner. You may even ruin an otherwise beautiful door. Visit a retailer or online store to take a look at available styles. If you do not find one you like, search for a company that sells custom doors. They have the skills and experience required to do the job right. If you are looking for a speakeasy door, you should visit Southern Front Stained Glass and Doors. They have many styles available, and can create custom solutions. Visit them in store or online at http://www.southernfront.com. You can also reach them by calling 281-890-5860. Searching for exterior doors is a lot like hunting for the perfect rustic interior doors. There are many factors you need to keep in mind. Some of these elements vary depending on the style of door you choose. It is important to focus on your preferences, and to buy a door that is durable. As long as you follow those general rules, your entryway will look exactly how you want. You can visit Southern Front in store or online to view their wide selection of rustic doors. They even offer custom solutions if you fail to find the perfect door for your home. Take a look at their catalogue by visiting http://www.southernfront.com. If you have any questions, you can contact them by calling 281-890-5860. Customers searching for Houston rustic exterior doors should visit Southern Front today.